Define a method initialize. This method is used once in the above code to create just one object at #9. Define a method to_s. In Shoes, para uses to_s implicitly at #10. If you comment out to_s definition lines, you will see the following output. Define methods press_0, press_1, ….. , press_9 with the method define_method. See ri Module#define_method. They are the same as the following. The .to_i is necessary for the case that @number is nil. Define methods press_add, press_sub, press_times, press_div. 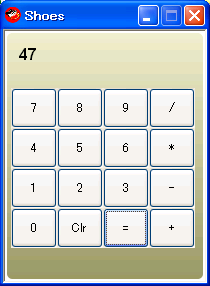 Execute the previous calculation (one of +, -, *, /). To clear the number_field at #13 (to show nothing), assign nil to @number instead of 0. Define a method press_equals. See the following small IRB snippet. Send the value (character string) that was assigned to the local variable method to the object number that was created at #9. See the following small IRB snippet. 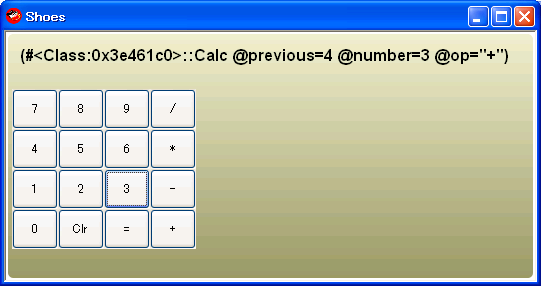 This line is defined within the button definition block (#11), hence every time when any button is clicked, number_field area will be refreshed. Replaced : to ; for Ruby 1.9. Then the simple-calc.rb worked well with Shoes-0.r1263.